Have you ever had an ear infection? If so, you’ll know the urgency of treating the pain and inflammation as quickly as possible. Fortunately, homeopathy has the answer – even during the dead of night. All you need is a little knowledge of the basic remedies traditionally used by homeopaths for the problem. Useful in the early stages of an ear infection, especially following exposure to cold, dry air. Rapid onset of symptoms. Intense symptoms. Person is restless, thirsty, anxious and sometimes frantic. Ear sensitive to touch. Worse at night, especially between 12-2am. Remember: Rapid onset; intense symptoms; restlessness; anxiety; thirst; worse after midnight. Often the right ear. Sudden onset of intense pain that may shoot or throb. Bright red ear or ear canal. Glassy eyes or dilated pupils. High fever. Often with headache. May become delirious in sleep, with nightmares. Hot head with cold hands and feet. Prefers the dark. Better for sitting rather than lying. Pain worse with light, noise, cold air, or being bumped. Remember: Rapid onset; intense symptoms; redness; often right-sided. Earache or glue ear that follows colds. Child is usually obstinate, pale and pudgy with a large head that sweats easily, especially during sleep. Anxious on thinking about unpleasant things. Often craves eggs and sweets or is sensitive to milk. Remember: Obstinate; timid; pudgy; sweaty head or neck (in sleep). Unbearable pain. Anger and impatience with the pain. Demand many things but push them away when offered. Can’t be pleased – nothing will satisfy. Cannot be comforted except by being carried or rocked briskly. One cheek red, the other cheek pale. 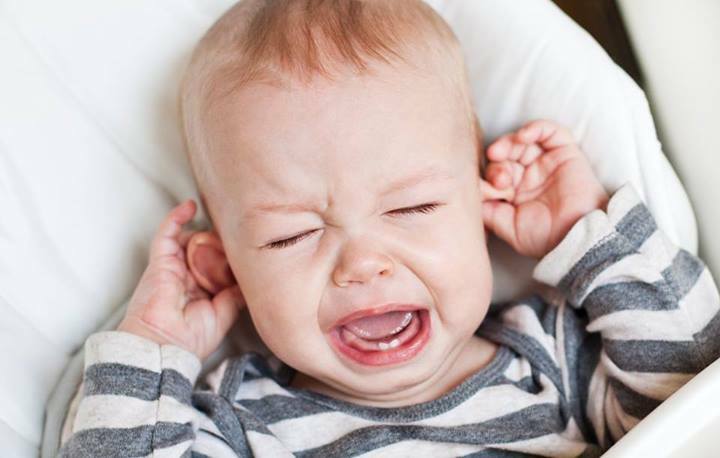 Earache may occur with teething. Worse at night and for warmth. Remember: Cannot be pleased; anger and impatience; better when carried briskly. For chronic ear infections rather than in first stage. Ear is extremely sensitive to touch of any type and cold air. May cover head or lie on affected side to keep ear warm. Pain often sharp like a splinter. Irritability or tantrums. Thick discharge from nose or ear smells like old cheese. Pain worse at night. Remedy may be needed to finish a cure started by Mercurius solubilis. Remember: Older infection; irritable; sensitive to cold and touch; ‘old cheese’ odour. Sharp, stitching or stinging pains. Intense itching or tickling inside ear. Thick, yellow and foul smelling discharge, often stringy. Irritable. Sweaty. Feels cold. Remember: Itching; stringy or offensive discharges; sweaty; irritable; chilly. For chronic ear infections rather than the first stage. Often right sided. May be discharge of pus that will be thick, burning, and have an offensive odor. Pus usually green though sometimes yellow. Thirsty. Bad breath. Salivation. Perspiration. Tongue flabby with imprint of teeth on edges. Glands or tonsils may be swollen. Sensitive to extremes of temperature. Pain worse at night. Remember: Older infection; bad breath; flabby tongue; salivation; offensive discharges (if present). Clingy. Seeks sympathy, company, and reassurance. Ear pain worse at night and in a warm room, better in open air. Worse for warm applications. Little or no thirst. Changeable moods. Thick, yellowish-green, bland discharge from nose if a cold is present or from the ear in advanced stages. Remember: Clinging, desires sympathy and comfort, thirstless, worse for warmth. Difficulty in hearing that often improves with blowing the nose, yawning, or swallowing. Discharge of blood and pus. Smelly discharge. Dried crusts within the ear canal. Itching. Children bore their finger into the ear. Head sweats during early sleep. Remember: Itching; difficulty in hearing; sweaty head in sleep. The pain from ear infections and inflammation often start in the middle of the night when doctor’s surgeries and pharmacies are closed – and should you eventually obtain some antibiotics, you might be in for a disappointment. Recent research indicates they are no more effective than simply watching and waiting for the infection to pass. That’s the last thing you want to hear in the middle of the night when trying to settle a distressed child but homeopathy does have an alternative to just doing nothing. So what can you do in the middle of the night? With a simple range of homeopathic remedies – all found in basic homeopathic home-use kits – a lot of pain and discomfort could be avoided. Parents and carers could learn to safely treat many simple acute problems such as ear infections, even in the middle of the night – and families would get a lot more sleep. Some of the common remedies for earaches and ear infections are listed below. A link to instructions on how often to give a homeopathic remedy has been placed at the end of the list. If none of these remedies seem to suit you or your child’s symptoms, please see a qualified homeopath for a better matching remedy, and if there is any indication that the problem is more than just a simple ear infection, please see a trusted healthcare practitioner for further advice. 1.Learn how often to use homeopathy with acute problems such as an uncomplicated ear infection by reading How Often Should I take a Dose of My Remedy. 2.Read accounts of children treated at the Homeopathy Plus clinic for their ear (and other) problems. 1. McCormick, D.P, Chonmaitree, T, Pittman, C, Saeed, K, Friedman, N.R, Uchida, T, Baldwin, C.D. Nonsevere acute otitis media: a clinical trial comparing outcomes of watchful waiting versus immediate antibiotic treatment. Pediatrics June 2005; 115(6):1455. 2. Frei, H, and Thurneysen, A. Homeopathy in Acute Otitis Media in Children: Treatment Effect or Spontaneous Resolution? British Homeopathic Journal, October, 2001,90:180-182. 3. Friese, KH, Kruse, S, Moeller, H. Acute Otitis Media in Children: A Comparison of Conventional and Homeopathic Treatment,‖ Biomedical Therapy, 1997,15,4:113-122 (reprinted from Hals-Nasen-Ohren (HNO), August, 1996:462-66. 4. Jacobs, J, Springer, DA, Crothers, D. Homeopathic Treatment of Acute Otitis Media in Children: A Preliminary Randomized Placebo-controlled Trial, Pediatric Infectious Disease Journal, 20,2 (February 2001):177-183.